In Spain, an old tradition regarding lunch during weekdays is still present today. During Franco’s dictatorship, it was decided to force restaurants to offer an economic meal for Spanish workers. The menu del día is still present nowadays, and it’s a cheap way to have a complete and good meal. More or less 10 euros includes first, second, dessert and one drink. Crazy, huh! Spain is different. At first you would think quality will be sacrificed for the budget constraints… you are wrong. 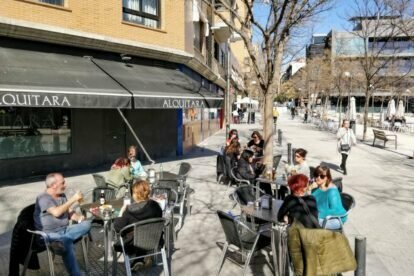 Many people in Spain don’t go home to have lunch nor eat at work; they go to a restaurant. These menus are simply put a presentation card of the restaurant. If it’s good, these workers will go there every day to have lunch, so at specific places, quality is guaranteed. Alquitara offers not only a classy menu del día, but also a diverse menu of tapas of high quality. The location is also marvellous, as its terrace gets a lot of sunlight. From there, you can see the plaza de Daoíz y Velarde, a pedestrian square locals of all ages frequent, especially around 18:00 – 20:00. In Alquitara, the food is a great deal and of high quality and the place is at a very relaxed location. I highly recommend having their menu del día, but if you can’t make it, enjoy their delicious tapas.